I have to admit, I’m not a huge fan of certain types of embroidery done on black velvet. Mostly, it’s colorful embroidery on black velvet that makes me shudder. Taken apart, I like the concept of embroidery on velvet, I like colorful embroidery, I like velvet, and I like black, but put them all together into the phrase “embroidery on black velvet” and it just Does Something to me. I blame it on Elvis. Larger-than-life images of Elvis painted in neon-esque colors on black velvet waft into my head when I think of embroidery on black velvet. Now, don’t get me wrong! I have nothing against Elvis – I like my blue suede shoes, too – but how anyone deserves to be memorialized in garish colors on black velvet wall hangings is beyond the scope of my understanding. So, you see, I generally shy away from embroidery on black velvet. This is raised goldwork, worked over card foundations, on black velvet. A while ago, I wrote a series of articles on Needle ‘n Thread on deconstructing goldwork embroidery. In the articles, I took apart a piece of old goldwork embroidery, so that we could examine how it was made, backwards. The techniques used in this raised goldwork piece above are essentially the same. 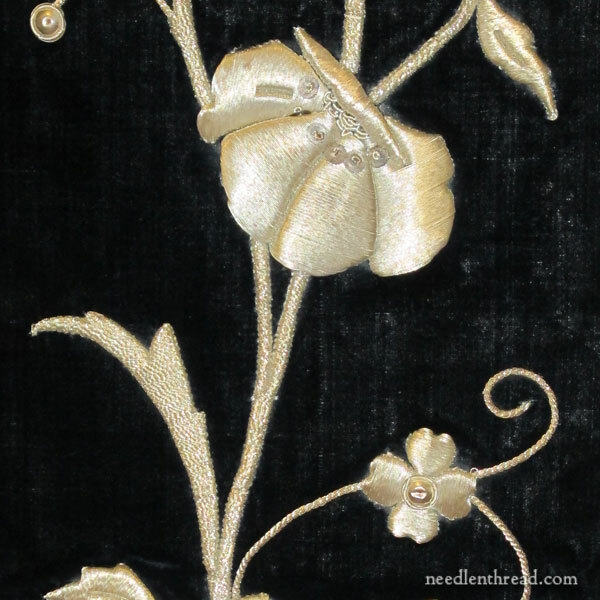 Fine goldwork threads are couched from side to side over raised card foundations to create high relief embroidery. This particular piece of embroidery adorns a birthday present I received last month. A friend who knows I like these kinds of things gave me an old chasuble, which is a church vestment, for my birthday. It is in very good shape, except for the lining, which is completely worn into shreds. The embroidery, though, is practically pristine, especially given the age of the piece, which is probably anywhere from 100-125 years old. 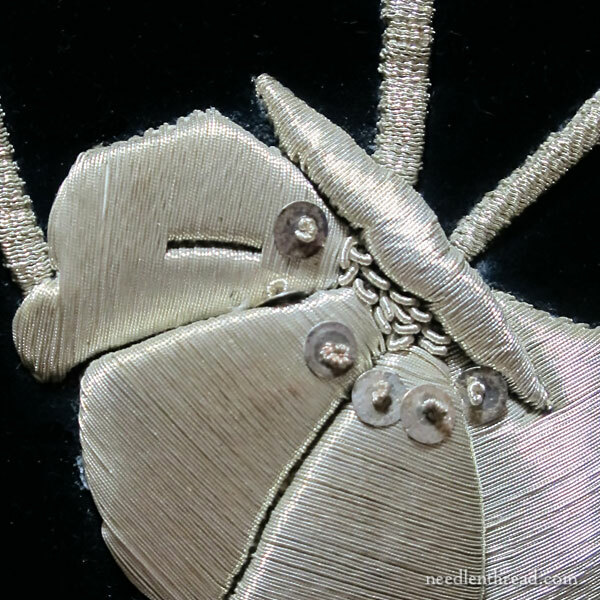 What I really love about this particular piece is the way the goldwork plays in the light. Sometimes, it looks almost entirely silver – like in the first two photos. But in some light, you can see the soft gold sheen of these antique gold threads. The piece is absolutely gorgeous – and it’s quite rare to find this type of embroidery on an old vestment, with the embroidery in such good shape. Because the vestment is in good shape, I donated it to a church. They’ll have their people replace the lining, make a couple missing pieces to the set, and then it can be used again in its intended setting. And now I’m going to stop thinking of embroidery on black velvet. I understand your feelings regarding Elvis “art” pardon the expression. But this goldwork is amazing.. I almost wanted to ask if it were done by machine? Hi, Elinor – It’s entirely done by hand, actually! Pretty amazing, isn’t it? Oh, my. I don’t think I have words to describe the depth and height and width of how beautiful that craftsmanship is. Wow. What a blessing to have a friends that send you things like that. Thank you so much for sharing that — what a blessing on this Tuesday morning. The accountant side of me just has to say this: Don’t forget to get a tax receipt for your donation, and put a good value on it. Hello, am I right in assuming the “card foundation” is just a piece of white cardboard? Thank you so much for showing us this gorgeous creation. One question: How large is the piece? I agree Elvis art not to my taste, but his music now thats another matter, I sing and dance along with you. But the embroidered goldwork piece above is stunning and it looks in such good condition for its age. How kind of you to donate the lovely birthday present and it will look lovely once it is restored to it’s former glory, although it still looks in great condition. Thanks for sharing this beautiful piece of old embroidery with us and Happy belated Birthday for last month. Lovely! I had no clue they made white gold threads. At first I thought it was silver, but then realized that it would have turned black/dark grey by now. I’ve seen jewelry and watches with rose or green gold, I wonder if those colors ever made into threads. Mary it is beautiful. I am going to post it on my FB page to let everyone see it. By the way, you are a really good photographer! You are most blessed to have a friend who knows your taste so well and whose gift is so generous! Gorgeous goldwork, thanks for sharing. But also, consider more options for poor black velvet. Well over 40 years ago, I cross-stitched kit using black aida cloth and a design based on Arab geometric tradtion, very colorful but not garish. I wanted to make two more pillows to match but could not find aida cloth anywhere. So how to apply the cross-stitch? I didn’t know about waste canvas, if it existed then. I persevered. Or rather, I winged it. I bought some black velvet, threads to match the original colors and eyeballed it. The velvet pillows, with the designs not quite squared and smaller than the original, came out well enough that the giftee still has them on display. Black velvet ground showcases the colorful geometric design in a way that duller aida doesn’t. I can see the potential for more uses–none involving Elvis. Trying it might yield other surprisingly pleasing results. I chuckled at the heading because I certainly wasn’t expecting to see the beautiful piece that you received. It must have been breathtaking in person because the photos showed the awesome work of someone. Thanks for sharing. Lovely work. Although I think you’ve covered it in other articles, thought I’d suggest that if anyone was looking for ‘card’ similar to this, 300lb watercolor paper would work. It’s pretty stiff, archival and could be cut to any shape…thicker & better quality than card-stock paper. Also, archival quality mat-board (used in framing) would also work. Thank you for sharing your work. I have only just started to learn embroidery with a group at a community centre. I have done little pieces that are basic and the tutor is helping us to do raised embroidery. Just finished the strawberries with only the felt supporting the stitching. But, to read about the lily was fascinating. Thank you for showing us this secret. Bless you. Isn’t that gold/silver thing called “vatican gold”? In addition to the “Elvis” thing, embroidering on velvet can be despicable to keep the nap from poking up through your stitches!! One thing I DO like to do on velvet (or velveteen) is punch work (igoluckoy), and then trim the loops — so you are putting a design of “velvet” within velvet. Let’em try and figure out how you did THAT!!! Beautiful work that. Looking back over the photos of padding, could it be possible that the bit on top of the felt is leather or animal skin of some kind glued to the felt ? Hi, Jacquelin – I think it’s possible to do that, but for the piece I deconstructed, it’s definitely paper. I took it apart and I burned a little piece of it to see what kind of ash it made – definitely paper…. Still stuck in your head? Happy Belated Birthday, Mrs. Corbet! That is breathtakingly gorgeous! You are very generous to hand it on to the church where it can be used and appreciated by so many others – and very generous also to share it with us first. Thank you! And happy belated birthday. Well, for historical sake of black velvet whether embroidered with color, silver or gold threads… It seems a bit of a pity Elvis Presley is mentioned with such gorgeous fabric and varying threads as modernistic or rock n roll era. When watching black and white films from the 1920’s on that is how some costumes appeared to be created from and with lovely embroidery. So I cannot see the garish in the beauty of black velvet and threads.